Hangover Crusher (R), GMT-ALC-5L (R), Milk Thistle. Ingredients: Carbonates Water, Fructose, Hangover Crusher (R) (Gojiberry Extract, Mandarin Peel Extract, Taurine, Sugar, Vitamin C, Vitamin Mineral Mixture, Essential Amino Acids Mixture, Citric Acid, Tartaric Acid, Stevia), Rice Soybean Extract (GMT-ACL-5L(R)), Milk Thistle, Taurine, Citric Acid, Mixed Fruits Flavour, DL-Malic Acid, Honey, Maltodextrine, Sodium Citrate, Natural Caffeine, Lactic Acid, Guarana Extract, Sucralose, Nicotinamide, L-Alanine, Vitamin B6, Vitamin B12. 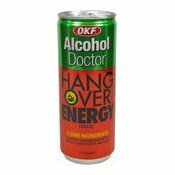 Simply enter your details below and we will send you an e-mail when “Alcohol Doctor Hangover Energy Drink (解酒飲品)” is back in stock!